Give those lifeless letters and packages a warm, stylish appearance with these elegant return address labels from CheckAdvantage. A glowing shade of amber with a wavy texture can give both your business mail and everyday envelopes an attractive personal touch. But the nicest thing about choosing this product is that it will make your day a little easier. You'll never have to painstakingly print your name and address on anything ever again. Since these are self-adhesive labels, you just peel, place and move on! 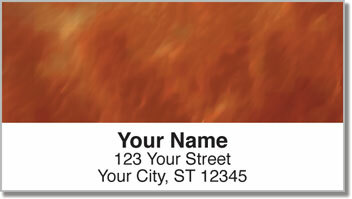 Get your very own Amber Light Wave Address Labels right now! This style is also available in other color choices as well as a multi-color option.